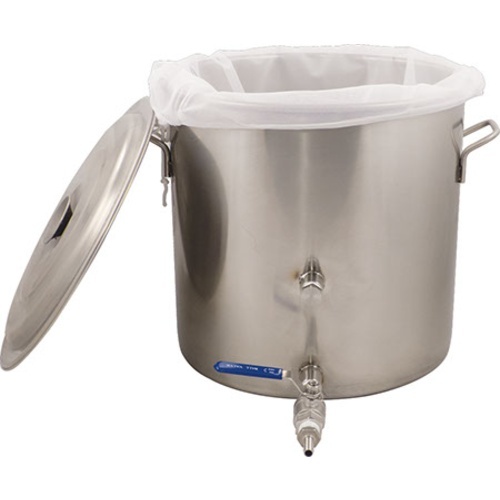 Our BIAB, Brew In A Bag, kettle and bag kit is the most affordable way to get into all-grain brewing. 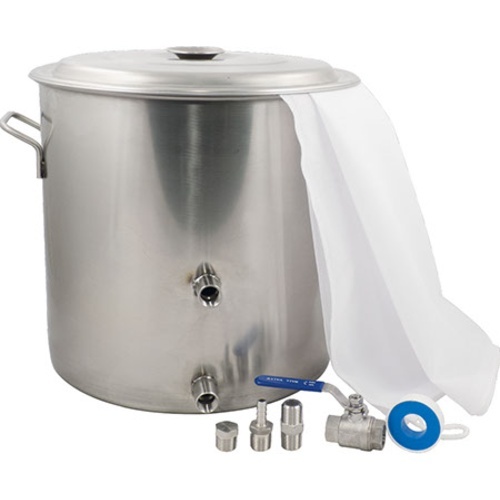 This hardware kit includes an 8.5 gallon kettle, ball valve, hose barb connection, 1/2" plug and plumbers tape to seal the connections. While it does not include directions (you easily google BIAB), the basic concept is that you place the bag in the kettle, add the grain from your recipe along with a measured amount of hot water and let it steep for 60 minutes. 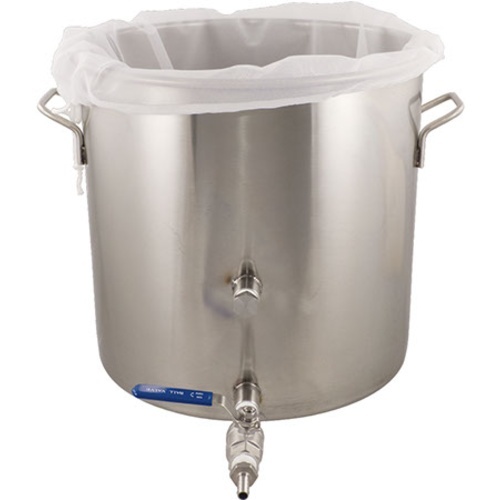 You then remove the bag and boil with hops in the same vessel. Very easy. Just want to let others know what to expect from this kettle. The kettle is not manufactured from one formed piece but rather it looks to be made from several pieces formed from flat sheet steel then welded together. The welds seems are ground "smooth" however not very well. The kettle seems sturdy enough however the lid is extremely flimsy and the handle really hard to grasp. The ports are ok but again, not the best weld job. I know this is an "economy" kettle and is probably functionally ok but I wouldn't have purchased it had I seen one first. That said, I contacted the company to return it and was told that, even though it shipped from the Pennsylvania warehouse, I had to send it back to California. Cheapest shipping to Cali from my location is $44 due to size so I guess I'm keeping it. Great kettle and value for the price. First batch of beer in this kettle is tasting very good! Kettle works great and is easy to clean. Only complaint is that the fittings seem to be a bit tight. Couldn't tighten them more than a few turns for the valve or an added thermometer.